Know methods to overcome the errors in Lotus Notes like “unable to find any path to server”, “Remote System No Longer Responding”, etc. All these error messages may arise if there is any connection issue between Lotus Notes and Domino server. You can check the connections by tracing TCP/IP by clicking on File >> Preferences >> User Preferences >> Ports >> Trace (Lotus Notes email client) or Trace Command (Domino Server). A message can be displayed: “The remote server is not a known TCP/IP host.”. It is possible when the connection is not recovered by rebooting the operating system or Notes client configuration. Right-click on My Computers and then select Properties. Go to Advanced tab and then click on Environment Variables. To add a new system variable, click on “New”. Now set to anything for CLASSPATH= or CLASSPATH.SAVED=. Click on Save to save the added variable and finish the process. Create a new location document in Names.nsf locally. It will help in forcing Lotus Notes to restrict the use of cached “last known good address” which is kept in the reboot. Open Notes email application. Click on Create >> Agent. In Agent Properties, click on Basics >> enter the name of the agent in the Name field. You can select Shared if you want the agent to be used by other users or Private if only you want to use that agent. You can specify some settings if the agent will search for text in documents. A user can check “Store search in Search bar menu” to show the query in the Search bar. A user can also check “Store highlights in document” to highlight the search matches in the searched documents. Now choose one of the triggers in the runtime section. Like “On event” to select the event or “On Schedule” to schedule the time. You will select the documents which depend on the trigger you have selected. Click on the Security tab and set up its properties. Then close the box. Click on Add Action and specify any simple action for the agent. Select Objects tab >> Document Selection >> Add Condition to allow agent to search for a document. To save the agent in the application, click on File >> Save. Sol: You need to check whether the connection between the Notes client and Domino server exists or no. To see the selected location, check the status bar. “Offline” means that Notes client is not connected to the Domino Server. If you have multiple Domino servers in your environment, then try to access a different server. Click on File >> Open >> IBM Notes Application >> Enter a different server. But if again the issue occurs then contact to help desk. In the following article, we have discussed ways to resolve the issue, “Unable to find path to Server” which is a basic error in Lotus Notes. Connection issues between the Notes client and the server is the main reason behind this issue. You can try above methods to resolve this issue. 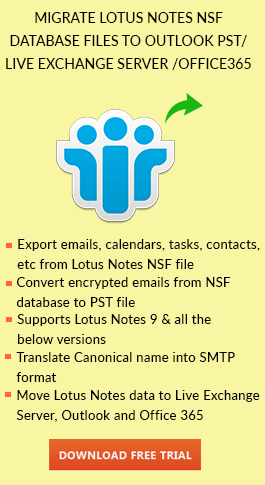 But you can also Convert NSF to PST with Export Notes software. Download now for free trial.